This ogee router bit is one of the more common profiles for edge treating woodworking projects. Each one is a 2 flute carbide-tipped solid shaping tool and all five styles have the radius, diameter and cutting length do-it-yourself woodworkers want. 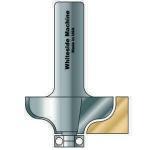 Whiteside router bits are manufactured by the award-winning Whiteside Machine Company. 1/4" 5/8" 1-1/2" 2-1/8" 1/4"
1/4" 5/8" 1-1/2" 2-3/8" 1/2"
9/64" & 5/16 5/8" 1-5/8" 2-1/2" 1/2"